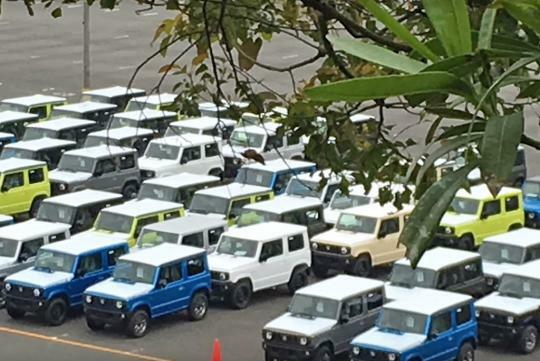 Suzuki's new small SUV, the Jimny, has been spied in Japan. With almost no camouflage, the car looks ready for sale. Seen in the video with a few shades of different colours, the car is supposedly all-new. It still uses a traditional ladder-on-frame chassis and will naturally be available with an all-wheel drive drivetrain. It is rumored to be equipped with either a 109bhp 1.0-litre turbocharged engine or a 89bhp 1.2-litre naturally-aspirated engine. With the car seen in the photo looking ready to be shipped, it is pretty likely the Jimny will debut at the Tokyo Motor Show in October. Come on CM!!! Start bringing in the new models please! !